Roku has launched two new devices, and they both provide 4K streaming for those on a budget. The Premiere and Premiere+ are tiny streaming players that boast both 4K and HDR capabilities. Which means you can finally take advantage of your new 4K TV The Best Affordable 4K HDR Smart TVs You Can Buy The Best Affordable 4K HDR Smart TVs You Can Buy Those in the market for a new Smart TV have a tough choice to make. It's not a gadget that you upgrade often, so you want something future-proof. So, what do you get? Read More . This time last year Roku unveiled lots of new hardware. This was a complete refresh of its lineup, and left consumers with a dizzying array of options. And now that situation is getting worse, with Roku launching two brand new devices. The Roku Premiere is a small but powerful device. It’s about the size of last year’s Roku Express, but adds 4K and HDR streaming to the mix. 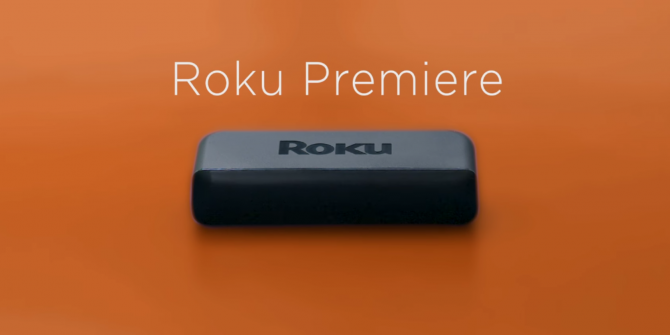 Priced at $39.99, the Roku Premiere is available to pre-order from Roku.com, and will be available at other retailers in October. The Roku Premiere+ is virtually identical to the standard Premiere. The only differences being it’s a Walmart exclusive, and comes with an enhanced voice remote. Priced at $49.99, the Roku Premiere+ will be available from early October 2018. The Roku Ultra remains Roku’s premium device. At $99.99 it still offers 4K, HDR, Ethernet and wireless connections, and an enhanced remote. However, for 2018, Roku is bundling a pair of JBL headphones worth $39.95 with the Ultra. With the release of these three new packages Roku has seven devices available to buy. So, Roku’s strategy seems to be to offer a huge range of different devices in the hopes of catering to everyone. And that scattergun approach may just work. Even with all this hardware Roku doesn’t see itself as a hardware company. Instead, it’s an advertising company that’s selling hardware in order to build an audience. And with initiatives such as The Roku Channel The Roku Channel Lets You Watch Movies for Free The Roku Channel Lets You Watch Movies for Free The Roku Channel -- a free channel offering hundreds of popular movies -- has now rolled out to all current-generation Roku devices. Read More , this strategy is clearly paying off. Explore more about: 4K, Media Streaming, Roku.